The following information may answer some of the questions you may have before making the final step in purchasing a puppy from us. For any questions that are not answered here, please visit the Contact Us page and send us an email, or feel free to call us at 775-BEST DOG. – When you receive the dog from us, you will have gotten a dog that has already been evaluated by a veterinarian and has received a clean bill of health. Therefore, we recommend that you take your new dog to the vet to make sure there are no other issues. If there any other issue that develop in your puppy before 1 year of age and after 2 weeks of being with you, there is no way for us to determine the issue did not arise due to negligence on the purchasers part. Therefore, there are no guarantees after 2 weeks of you having your puppy. Any issues, must be brought up to us within the first 2 weeks of having received the dog. – We offer a standard health guarantee, which covers hip and elbow guarantee on all our puppies, good up to 1 year of age. In addition, we guarantee there is no genetic disorders up to 1 year of age. If there is an issue with hips, elbows or genetic disorder, the puppy will be replaced but must be verified by a certified vet and confirmed by our vet. You will have to pay for the shipping of the replacement puppy. No other specific or implied guarantees are included. On the highly rare situation where this may occur, you WILL HAVE TO PAY for the shipping of the replacement puppy. Or, you are welcome to pick up the puppy and bring the original dog back at the same time. SHIPPING IS NOT INCLUDED IN OUR GUARANTEE! No other specific or implied guarantees are included. – We also have a health, hip and elbow guarantee up to 2 years of age, at an additional $750 charge as an option for those who desire it. For this additional health, hip and elbow guarantee (same as above but up to 2 years of age), the purchaser must agree to adhere to a specific dietary requirement (you must feed the dog “raw”). No other specific or implied guarantees are included or inferred. By purchasing a dog from our facility, you are agreeing to all the above. – For breeders, there is an additional breeder’s guarantee at a charge of $500, which insures that your dog will be of good quality and able to breed. This guarantee includes descended testicles, full bite, both ears up, proper confirmation, etc, in addition to the hips and elbow guarantee. Although, 95% of the time this is not necessary, if you are serious about breeding, you should have this guarantee in place. Otherwise, you never know what could happen. There is always a possibility that there may be an issue and in that rare event, your breeder’s guarantee covers you. For the breeder’s guarantee, there are no other specific or implied guarantees which are included. No other specific or implied guarantees are included or inferred. The ability of the dog to breed is NOT covered by this guarantee, just that they will be of breed able quality. For example, your dog could be exposed to something that makes him or her sterile, or is injured and is no longer able to have viable sperm or carry puppies. That is NOT our responsibility and is not covered in the breeder’s health guarantee. By purchasing a dog from us, you are agreeing to all the above. No other specific or implied guarantees are included. All guarantees expire after 1 year of age, and 2 years of age if that selection has been made. The simple reason is these are live creatures, and how you maintain them will make the difference. If you feed the dog differently, or give the dog the indiscriminate schedule of vaccines, etc, they will develop health issues such as allergies, rashes, etc, or may affect developmental problems. This is also associated with other health issues later in life with the dogs. Thus, our guarantees are only for 1 year of age. On dogs that are purchased older than 6 months of age, the guarantee is up to 1 year after the purchase date. – In the rare event that something like this were to occur, we may, at our discretion, decide to replace the dog. In order to receive a replacement dog, all vet records on the original dog must be sent and reviewed by our vet. As previously stated, you will be responsible for shipping the original dog back and also the shipping costs of the new dog. Or, you can simply bring the dog back and pick up the new dog and save all the shipping costs on both sides. – Remember, this is a LIVE ANIMAL we are discussing. Once you have the dog, you are responsible. Resulting health issues due to negligence, poor diet, inadequate care, etc, are not covered by our guarantee and is not our responsibility. We do NOT restrict breeding rights. However, if you are purchasing both a male and female from us, you must agree to keep our kennel name on the offspring puppies for their registration with the AKC when they are born. This is not needed if you only buy a male or just buy a female from us. However, purchase of a breeding pair requires that our kennel name remains on the future resulting puppies. For example, what ever you name your puppies, the last name would bare our kennel name. Example: You decide to name a puppy “Falco”. Registered name would be “Falco von Wiese”. You have made a very wise choice and we are committed to distinguishing ourselves from all other breeders, just as you will witness yourself the distinction and superiority of our breeding program based on the quality of your new all black German Shepherd addition. Thank you again for choosing Kennel von Wiese as the place to find your future member of your family. If you have any questions, feel free to contact us at 775-BESTDOG (775-237-8364). 1. 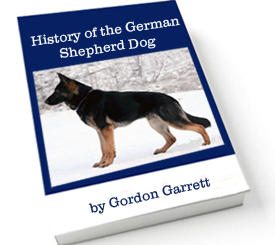 Name you want to use for your new black German Shepherd. 2. Name starting with the letter of the litter the puppy was born in. You want to name the dog “Falco”. The dog was part of the “M” litter. Because the dog was from the “M” litter, you would need to come up with an M name as well. Or we can assign the name…if you don’t want to choose it. For this example, let’s say you give the “M” name as “Maximus”. The dog would then be named Maximus Falco von Wiese. So your desired name (the name you’re going to call the dog on a daily basis), will be the middle name. The “M” name (litter letter name) will be the first name in the registered name. If you have any questions, feel free to call us.